Our exclusively designed Garlic Roaster is a great addition to our product line and a must have to complete any great La Chamba collection. The even heating qualities of the clay make it the perfect vessel to slowly roast up to four garlic heads, allowing the garlic cloves to slowly caramelize. It is so easy to use; anyone can enjoy the aroma, and use the roasted garlic in recipes such as soups, sauces, pizzas, or simple spread on toast. 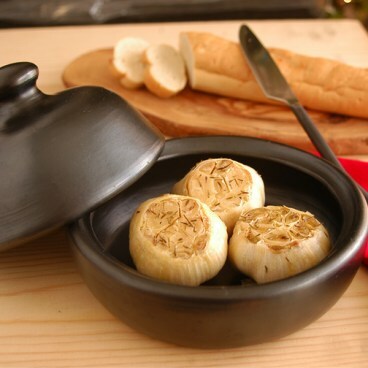 With our Black Clay, La Chamba Garlic Roaster, anyone can enjoy the aroma and smooth flavor of roasted garlic. The roasted garlic can be used in many recipes including soups, sauces, pizzas, or just as a spread. Our exclusive design is a great addition to any La Chamba collection. The evenly heating qualities of the clay make it the perfect vessel to slowly roast up to four garlic heads.